I am a huge fan of carrying a pocket knife with you wherever you go and because of that I am constantly buying a trying new knives in the search of the “perfect” knife (you know the one that doesn’t actually exist). I have been a huge fan of SOG knives for the last 5 years or so and own several of them. I typically find that SOG knives are well made, handle nicely, and are priced well when compared to most other knives. SOG typically prices on the high-end of what you would see at a retailer like REI and the low-end of what you would see at knife shops (around $100-150 a knife on average). 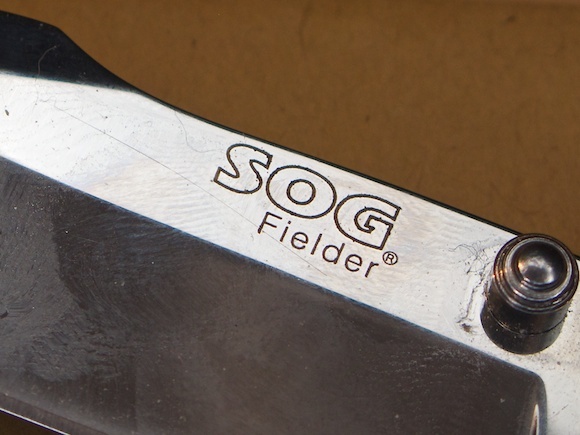 Recently SOG announced a new knife: the “Fielder” series. These look like the knife your grandpa may carry and not like the techno-wonder knives that SOG typically sells. They also are pretty basic: straight edge, thumb screw open, liner-lock — no fancy assisted opens or v-cutters here. These knives are also aggressively priced starting at $25 and going up to $35. I was about to order one when I saw the price and was turned off by how low it is. Typically knives this cheap aren’t worth the time or trouble. Then over Vetran’s day they held a sale, $20 for the knife that is the mid-size $30 offering. I took the plunge to try it out. This is a knife that after a years patina will be passable as a knife that your grandfather handed down to you. The styling is classic with polished metal and wood meeting at the perfect intersection of badass and classic (classic badass?). The blade is your standard no-nonsense straight edge with an upward curve to the point. The back of the blade is tappers from thick to thin leading away from the handle. This is for blade control by giving your thumb a more substantial area to rest on — while also strengthening everything. The look of this knife is what initially drew my to it because it rids itself of the high-tech plastic that is becoming very common and just takes me back to another time — when knives were accepted as something you just always carried. I am going to look at two components to the handling of a knife: gripping it and open/closing the knife. The knife is very chunky and the result of that is a rather comfortable fit in your hand. When you apply serious pressure and grip on the knife there is only one part of the handle that starts to dig in your hand: the lock mechanism. This is a necessary evil to make the knife close easier with one hand. When carving with the knife I find the control very good, with the indented back of the blade a good spot for controlling the blade movement. The length of this knife is perfect for my hand, and should continue to be comfortable for smaller hands. Larger hands will begin to hit the curled back edge of the knife, which may cause a point of discomfort if the knife is used for extended carving sessions. The back of the blade is not comfortable when pressing your thumb against it and it will leave a mark after extended carving. It is not however to the point where I would shy away from controlling the blade with my thumb. This is where the knife fails for me, I can’t open it with one hand because I am left handed. The knife is only set up to be opened with one hand: your right hand. I am not as practiced with opening on my right hand, but in my attempts I found that my right hand could easily open the knife one handed and get to lock every time. After each open though my hand was not position for use, requiring a shift so that I could use the knife for anything. That’s a minor point given that this seems to be the case with every knife that I have used. Closing the knife is also a right handed task. The liner lock is easily pushed clear and the blade closes up nicely. I never once felt as though the knife would chop my thumb off if I didn’t clear my thumb quickly. 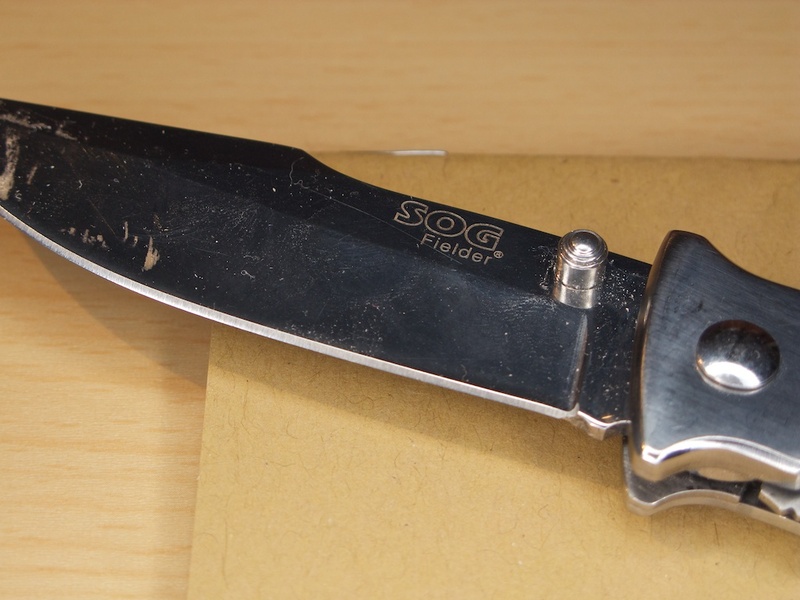 There is no spring mechanism in the handle of this knife, unlike you may find in other locking knife mechanisms. Most importantly opening and closing could be performed without looking at the knife with ease. This is the most important part of a good pocket knife to me and the Fielder passes this test — albeit only right handed. There are three things that I use to evaluate how good a blade is: how sharp it is from the factory, how easy it is to get the blade back to sharp, and how long the blade stays sharp. These are all pretty subjective tests so it is just a matter of my opinion. The arm hair test: how easily does the blade shave the hair from my forearm. I test to see how even the sharpness is based on the evenness of the hair across the blade. (Needless to say I can’t run this test over and over.) I also test to see how smoothly the hair was shaved off. The paper slice in the air: hold a sheet of paper in front of you parallel to the ground. Slightly curve the paper so it stays up. Slice the blade from the end inward. If it cuts, how clean is the cut? A sharp blade should produce a clean cut without flopping the paper over. Those are my tests and you may have others you like better, but I have been testing this way for years so I stuck with what I am comfortable with. As for the use and abuse of the knife I cut everything I could this week, lots of cardboard, tape, wood, plastic and so on. Cardboard actually will dull a blade pretty fast so I find it is a good way to test knives. The Fielder is made with 7Cr13 stainless steel and I have no clue what that means. Google doesn’t even really have a clue what that means. From what I have read in online forums filled with knife lovers the 7Cr13 stainless is a Chinese import steel that is relatively cheap and not what is considered “high-end”. Most compared it as slightly lesser to the AUS 8 steel (Japanese) that SOG uses in their other knives, which is not as good (apparently) as the VG-10 (still with me?) that is used in the more expensive SOG knives. Practically speaking what does this mean? From what I gather the steel is softer than high end knives and thus likely will not hold a sharp edge for as long or be good for prying. Ok, that seems like a fair trade off for a knife that is $30. I read a lot of other forums that basically said you need to ignore all the marketing hype around the steel used in blades. What it comes down to is this: expensive knives are expensive typically because of the steel used. So if you want a cheap knife then you get cheaper steel. This is like grading diamonds, some people are fanatics and only want the whitest, clearest diamonds — while others are just happy to have a diamond. I actually have five SOG knives. Two are using the 7Cr13 stainless, two the AUS 8 stainless, and one 8Cr13MoV (who the hell knows what that is). Here is what I have found: the AUS 8 knives generally hold their edge better (meaning less sharpening), but not to the point where I would shy away from the other steel grades. I am sure you are tempted to email me about this, but the fact is that a well sharpened knife is sharp. 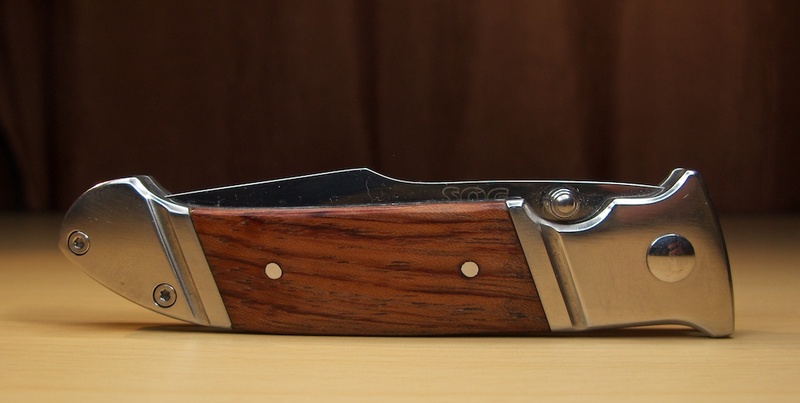 We are not talking about a knife for survival so the most important thing is not how it will hold up if you need to use it as your main tool for a year, but how it will hold up from day to day: and it holds up fine in the latter case. The type of steel this blade is made out of allows for very easy sharpening. I have had no trouble whatsoever getting a good sharp edge on the knife. I have used a simple v-sharpener that I carry when I backpack and more sophisticated sharpeners like a diamond system and Japanese sharpening stones. All worked just fine and I found that a respectable edge could be had off of just the v-sharpener and a rather fine edge off of better sharpening methods. This is a tricky one. After substantial box slicing and wood carving the blade was still able to shave hairs off my arm — just not as smoothly as before. Where things really were evident was on the paper slicing test. Here the blade was noticeably less sharp — not to the point of being dull and unusable, but certainly not something that I would be happy with. Again this knife is $30. This isn’t a knife I would take camping, but it is a knife I would be fine keeping on my desk or around the house. In practice I would guess that if you used the knife everyday to open your Amazon deliveries you would need to hone the edge back once a week. The AUS 8 steel knives I have seem to hold an edge for at least a couple of weeks. The overall quality of the knife is much higher than I expected given the pricing. It very much feels like a mass produced good, but it also feels very substantial. That said I don’t think the knife is perfect and I don’t think it needs to be. One nice “feature” is the knife is assembled with screws instead of rivets. What’s nice about that is that you can, theoretically, tighten back up the knife if things start to get wiggly. Overall the blade has a little lateral play in it when locked, but not enough to worry me when using the knife under normal conditions. You probably want to steer clear of prying anything though as the handle has some flex in it where the wood inserts are. The polished finish is average. The grooves routed into the handle look like crap, there was no attempt made to polish in these grooves or even sand the metal to a smoother finish. While the wood insets look very nice, they are also going to be your first point of failure. 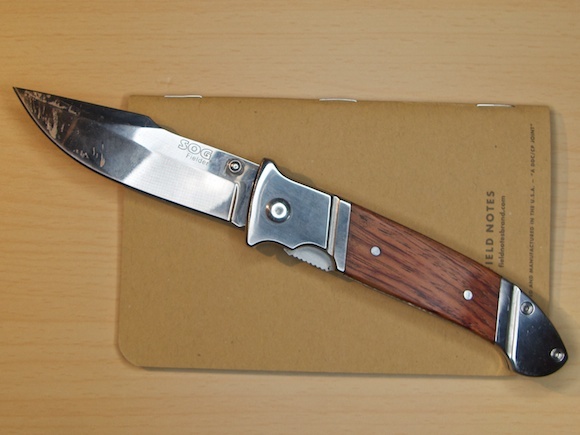 This is not the knife that you would want to take out in the woods for survival, the weather would likely take a toll on the wood handle inserts. The blade is of average quality. Better than a cheap knives that you find at the checkout stands of auto parts stores. I haven’t found the blade itself to be weak, but it’s not the best at retaining a sharp edge as mentioned above. The pivot and lock for the blade all seem fine. This is a tried and true system for locking pocket knives, not something I suspect will fail — probably the last thing to fail on this knife come to think of it. Yes, in my experience anything in your pocket will eventually cause the marks that you are referring too. This likely will too as it is thicker than my iPhone 4S. Something between tin and steel. Its speed is OK. I would say the assisted open is far better for speed, but much more dangerous to your fingers. This knife is OK with speed and poses little risk to your fingers. Good question. I am a proponent of carrying a knife every day (EDC means: “everyday carry”). Typically I use it for opening packages and trimming strings off of clothing and bags. I am also a property manager by day and find a lot of uses cutting free zip ties and taped on items. You mileage will vary, but I typically have a use for a knife once a day — never to the point of not being able to walk to a drawer if needed. Also: I never eat Apples with a knife. I never understood that. Sure. Yep. Nope. Hell no. I’d be happy to try it on your shoe and barring any steel toes I am sure it could if you applied the right pressure. I value my toes too much to try this one. Good questions, I like the way it feels in my hand and I find the workmanship decent but not great. I do however enjoy using it and that is mostly because it looks fantastic. Good question. No, I think you may want to try this. Yeah that’s a great question. Overall I think this knife is too large to be an everyday carry option with the blade length of 3.5 inches. My ideal everyday carry blade length is closer to 2.5 inches — allowing a good length of blade and handle, but not an intimidating amount of blade. This knife is better suited to toss in your pocket when you are doing manly tasks, not when you are running to get a Frappuccino refill. I think that people will very much perceive this as a knife that could hurt them — a weapon more than a tool. 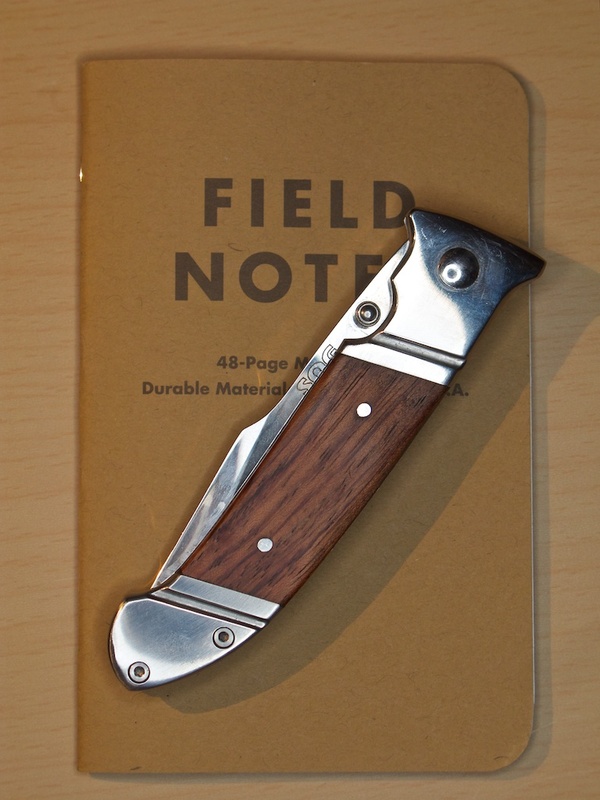 I wanted to review it because I think that too many people want to want to carry a pocket knife (huh?) but decide not to because all the “cool” looking knifes cost too much money. Let’s try that again. I wrote this because I think you should be carrying a pocket knife and I wanted to show that there are options that won’t cost you an arm and a leg (while still being able to actually take them if you want). I think the smaller Fielder mini is a great knife to start with because of the size and price. At $25 it is cheaper than those blog themed t-shirts you buy. I’d say 42, or there about. Ok, so here we are. We have a knife that is too big to really be an everyday carry and too cheap to really be great. So what’s the verdict? I don’t regret buying this knife at all, but I don’t think I would buy it again. This is a fine knife for leaving about in your home to handle the odd chore. Anything more than menial tasks and I would opt for a better knife because I have much better knives. 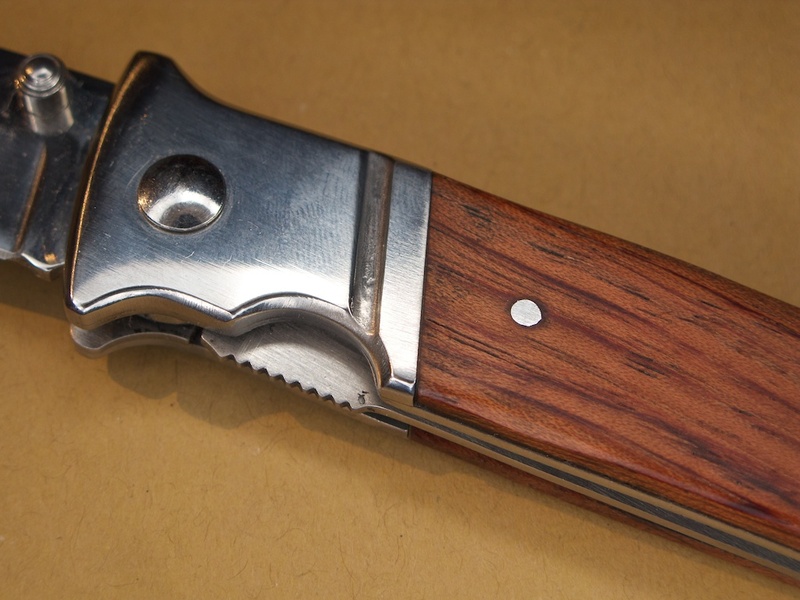 Having said that there is a large class of people that just want a knife that looks cool and cuts on the rare occasion that they need it to cut. For such a purpose this knife is exceptionally well suited. However based solely on this knife I would certainly by the smaller version as a starter everyday carry knife. It looks like a great size at an amazing price. If you want to save money (and help TBR out) you can buy these knives from Amazon where the Fielder is still $19.99.